Worldly Muslimah: What do the Mumbai Attacks Mean for India? What do the Mumbai Attacks Mean for India? Shown on the left a picture of one of the Mumbai gunmenn, as he walks at the Chatrapathi Sivaji Terminal railway station. The attacks that started Wednesday night took everyone by surprise. It became apparent soon enough that this attack was different from the previous ones that had occured in Mumbai on other occasions. There appeared to be coordination between the gunmen as they fanned out to specific locations, shooting at anyone in their paths. To compound the situation, the gunmen attempted (and were successful) in taking hostages. The situation (today is Friday) continues to unfold as I write this. Check out Vinu's Flickr for photos of the blast and navy activity. The identity of the gunmen remains a big question, but already ideas are floating around. First, the gunmen were reported to have asked for Western passport holders (namely American and British) at the two hotels they had stormed. Second, the gunmen were reported to have asked for the release of Islamic muhajideen held in Indian jails. And one of the locations a group of the gunmen had stormed was a Jewish cafe and synagogue run by an American Jewish man and an Israeli woman (husband and wife). And a group called the Deccan Mujahideen had claimed responsibility for the attacks. It follows that Islamic radicals are responsible for the attacks. The Indian government has also stated that "foreign" elements had been involved in the attacks, in a thinly veiled accusation at Pakistan. Indian police are investigating a mechanised fishing boat that had gone missing along with five of its crew from near the Pakistan maritime border 13 days ago. All things considered, people are pointing the finger at Islamists. Any insight into where the terrorists might come from, then? An Indian businessman who says he heard the attackers said he didn't understand the language that the young men were speaking. That means that it wasn't Hindi or Urdu… most Indians would recognize the major languages even if they couldn't speak one of them. But most Indians would be unfamiliar with what's spoken in parts of the Kashmir. That's a source of much of the terrorism. My guess is that ultimately this will turn out to be some outside jihadi groups who might also recruit among disaffected Muslims locally. But there has been many other reports that indicated that the gunmen spoke in a language that was understood by the Indians - and many said they were speaking Hindi. Before people rush to conclusions, we should keep in mind that there is much uncertain about the identity of the attackers. The attacks were horrifying, but not surprising at all. 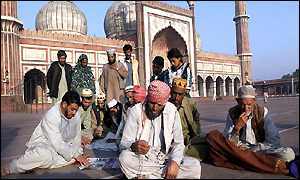 India has a record of discrimination towards its Muslim minorities(which btw has the second largest Muslim population the world after Indonesia). Discrimination is putting it lightly, and it is probably an inadequate word - for instance, it does not convey the 2002 Gujarat massacres, which should more appropriately be called a genocide. It has been shown that the Gujarat government, with Narendra Modi, was complicit in the Gujarat masscares. Funny thing is, Indians recently voted Modi back into office! He was elected again for a third term on December 23, 2007 with an emphatic win in the state elections, which he had cast as a "referendum on his rule". So much for the Gujarati sense of justice. After a series of bombings in western India in July 2008, emails were sent out by the alleged perpetrators, which claimed that the attacks were "the revenge of Gujarat". Simply put, Indian Muslims are disenfranchised citizens. It will not be surprising that if it does turn out that the gunmen were Indian citizens. Muslim militants have been responsible for much of the violence that has plagued Mumbai in recent years. But these attacks seem to be of a different magnitude. One of the untold stories of India is that the Muslim population has not shared in the boom the country has enjoyed over the last ten years. There is still a lot of institutional discrimination, and many remain persecuted. There's enough alienation out there that there are locals who can be drawn in to plots. That tends to be a pattern, from Madrid to Casablanca to Bali — some hard-core jihadis who indoctrinate alienated locals they can seduce. Too many people are quick to shout out that absolutely nothing justifies violence. But such an attitude will never rid the world of violence. It is human nature to lash out against injustice - certain individuals are more apt to be susceptible to violence to correct injustices. Case in point, South Africa's fight against apartheid, Palestine's struggle against Israeli occupation. The weak and the oppressed fight to make a show of defiance - who would want to remain under the foot of another? If you want to rid the world of violence, remove the underlying factors that provoke it. It is not an impossible task - and it only becomes so, if you believe it so. Hopefully, the world (or at least India) heeds the call. But the chances of that happening are minimal. One reader comment from an Indian woman named Neha was calling for an Indian Bush to attack Pakistan so as to prevent further attacks on India. Rational heads should prevail, but sadly, the Indian government is only too keen to play the blame game than make a move towards real positive changes that uplift their disenfranchised Muslim citizens.